Having so far remained underground, a Lithuanian radical fascist group is emerging into public view. People are being urged to awaken fascism in themselves and destroy democracy in the country's major cities. Intelligence services are monitoring these youths carefully, while political scientists see Kremlin influence behind these radical right-wingers, TV3 news reports. The youths wearing black costumes and hiding their faces behind intimidating masks attracted public attention last year, during the March 11 march in the capital. 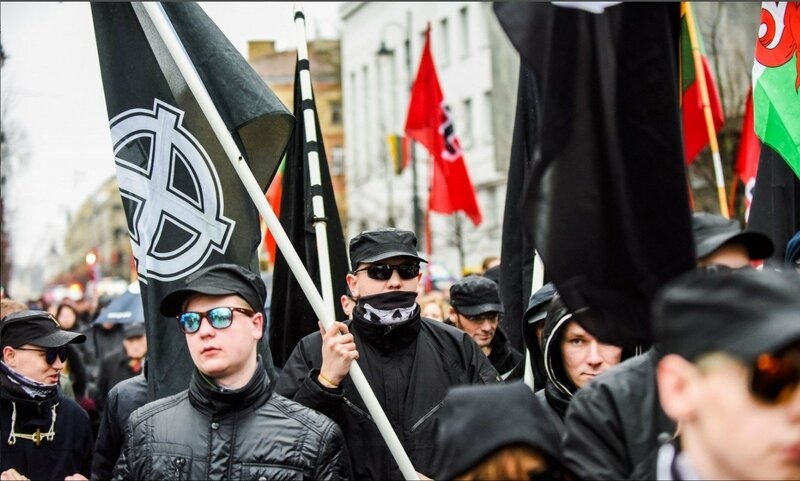 Marching alongside nationalists, the men stood out with openly displayed Nazi symbolism and a massive anti-Semitic, homophobic placard. The public appearance was limited to this, the group vanished underground. That said, the imagery of fascism in Lithuania was eagerly displayed by Russian propaganda news media serving Vladimir Putin's clan. 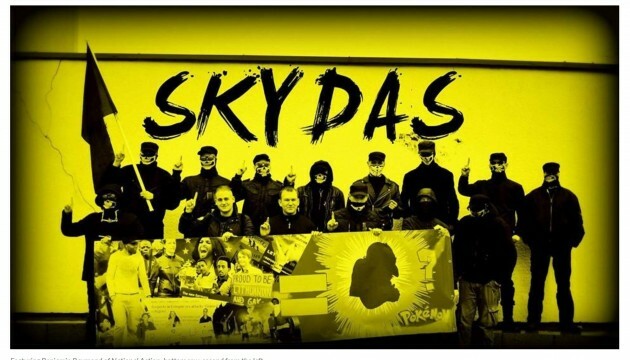 In recent days the activity of these anonymous individuals has become more active, both in Vilnius and in other major cities, the Skydas ("Shield") organisation's stickers are being put up, urging to awaken one's inner fascist and beat liberalism. 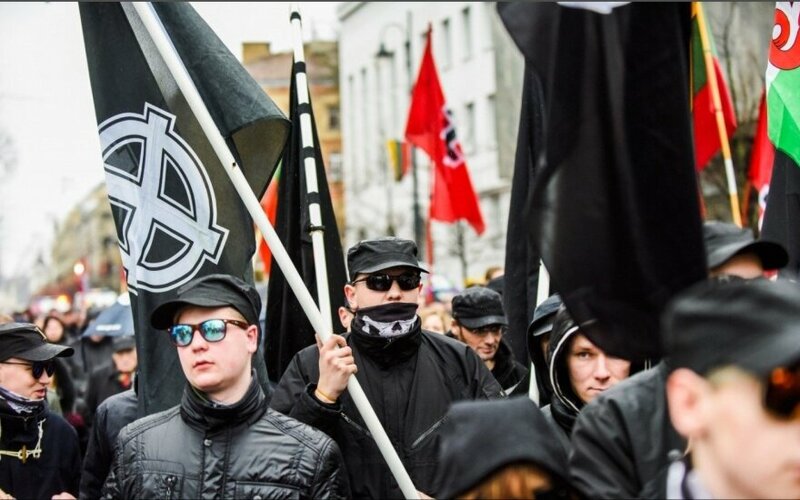 There are ample tracks of the neo-fascists online as well – while their Facebook profile is blocked, the radicals share photos and video footage on YouTube and Twitter. Their website features a wide list of members. One of the core supporters for it is the head of a Nazi group banned in the UK, Benjamin Raymond, who it would appear has been to Vilnius to support his colleagues. The stickers, placards and flags for Lithuanian fascists are being manufactured by Serbian far right organisations. By the way, Skydas organises international nationalist conferences in Lithuania. An individual who wished to remain anonymous and has been observing the group for a number of years now explains that the members of Skydas are former political science and philosophy students. "They relinquished violence not only because it would make them easier to recognise and arrest. They believe that violence worsens the image of fascists in the public, thus more can be achieved through activism, than by beating foreigners," he told TV3 news. While one of the group's representational video clips show much Nazi symbolism and have no lack of homage to Adolf Hitler, it would appear that the fascists are seeking to shed their old image of being skinheads. The youths in the photos look nothing like musclebound, aggressive hooligans. The fascists are seeking to represent themselves in a more modern way. Despite these individuals not yet being linked to any violent incidents, their activities are being monitored by the State Security Department (VSD). There are suspicions that these radicals may be made use of by the Kremlin and its media. "If we take the case of Latvia, that there is much fascism, then it is incompatible, it is being propagated. The same comments are being stated to Lithuania as well. Let me stress, in Russia media, in displays to the Russian public we are displayed as "decadent", causing antagonisms," the head of the Seimas Committee of National Security and Defence Vytautas Bakas told TV3 news. Political scientists believe that the group is accenting fascism unnaturally because this term has never been popular in Lithuania. It is more prominent among Russian propagandists, thus Skydas is likely simply performing the role of useful idiots. "This is an excellent tool for Kremlin propagandists – saying that fascism is being reborn in Lithuania and reproach Lithuanian politicians, as well as the world's, Western Europe's and American journalists that "Here, Lithuania isn't coping domestically." And perhaps it is a possibility, which V. Putin and his predecessors liked doing with his neighbours, saving from fascism," political scientist Algirdas Kazklauskas told TV3 news. TV3 news were able to contact with Skydas representatives and hold a brief interview. Unfortunately they were unwilling to directly meet with the journalists. "Since no-one represented this among the Lithuanian youth, we gathered. We are school and university students. Our youth dictates our protest methods and appearance. We love all the nations of the world. A fascism for each nation," the organisation's representative shared his position. Analyst Ričardas Savukynas notes that the Skydas representation is based on futurism and aesthetics, which was typical to Italian fascism and Benito Mussolini's ideology. While the group is currently not large, it is important not to become careless. If suspicious activities are observed or banned symbols are being portrayed, the police should be contacted. "All radical groups are more or less dangerous. In some cases they grow into larger movements and this is why we have to continue carefully watching. Radicalism is inclined to sacrifice people for ideas," R. Savukynas pointed out. According to political scientists, such groups have been experiencing a sort of renaissance in Western Europe in the past few years. While not being received with much popularity in Lithuania, they are openly entering politics in other countries. Take how Marine Le Pen of the radical right in France entered the second round of the presidential elections. Quite recently members who broke off from Pegida, which attacks Muslims, entered the German parliament and won more than ten mandates. The Netherlands almost held a radical supported referendum over leaving the EU. The wave of far right popularity is linked to the migration crisis from the Middle East and terror attacks in major European cities.